In 2001, Angie Boudouris moved to her dream space in the country. Her 5.5-acre horse farm was bordered on two sides by Oak Openings Metropark. There was a large barn and 3-3.5 acres of pasture for her horses. Large oaks and pines – some as high as 90 feet – graced the landscape. Life was peaceful. When a category four tornado hit in 2010, the landscape Angie loved changed dramatically. Trees simply disappeared. Grass and pasture became bare ground, and eventually invasive species. Fortunately, no one was hurt, and the house and barn remained intact; but the property was devastated, or so she thought. She tried to grow plants in small areas at first. Some friends who live in the Oak Openings Region gave her some lupine, other native plants and some seeds which she planted in a 25-foot circle where a pine tree once grew. The plants, especially the lupine, took off and she continued to try to bring small patches of her property back to life. 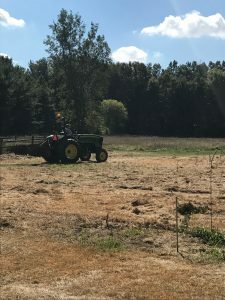 The pasture remained a problem because of the invasive species..
Angie contacted The Nature Conservancy (TNC) and The Green Ribbon Initiative (GRI) in 2016 and they came out to look at her property. When she met Ashlee Decker from GRI at a community film on nature shortly afterward, Angie learned that native plants could be the answer she was looking for to bring her property back to life. Angie was not unfamiliar with native plants. She’s been a volunteer at TNC’s Kitty Todd Preserve for many years and has collected seeds with Wild Ones, a local non-profit organization dedicated to helping people grow native plants in their yards. That moment of clarity resulted in a commitment to restore her property to its native oak openings state. Since then, Angie and GRI have worked together to map out a plan. lready growing and decided what to plant new. 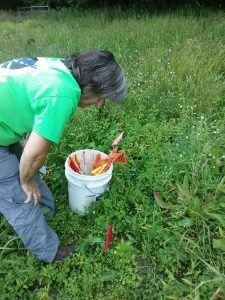 Under a grant from the Environmental Protection Agency, the Nature Conservancy helped Angie clear about an acre of non-native grasses and buckthorn. Angie also burned and drag farrowed the ground to prepare it for the native seeds. It was important for her to have native Oak Openings Region seed, so Angie took advantage of GRI’s native seed program and traded volunteer hours for the costs of the seed. As a part of this program, Metroparks Toledo staff came out to the property to assess Angie’s soil. They created a specialized mix of native Oak Openings seeds for her property. It will take some time for the new natives to take hold, but Angie is already seeing signs of life as a direct result of the restoration work. She admits, however, that it takes patience. Restoring a prairie does not yield the same instant gratification of traditional landscaping. For the first several years, native plants put most of their energy into developing an extensive root system. This means that the above ground mass stays relatively small and many of the plants do not flower. Meanwhile, the annual non-natives take advantage of the bare ground and need to be managed by mowing them down before they go to seed. Since the native plants are working underground, mowing the prairie won’t hurt them. And there are signs already that Angie’s wishes will come true. Hiding under the horsetail, there are tiny native flowers making her pasture their home. Among them, spotted horsemint, a state endangered species that was added to her seed mix. Bergamot, black-eyed susans, lupine, little blue stem, blue and white vervain have already started to come back, and birds have settled in to the new habitat. Angie’s ultimate goal is to use her property to help educate others on the importance of natives and to serve as a source for native seeds. The natural habitat is coming back. Bluebird boxes are up, and a new friend released 20 monarch and swallowtail butterflies on Angie’s property. Interested in becoming an official property within the Oak Openings? Whether you choose to undertake a full-scale project like Angie Boudouris or simply want to become more aware of what’s in your own backyard, there are many free local resources that can help. The first step is to register your property with the Oak Openings Green Ribbon Initiative Landowner Registry. Contact ashlee.decker@tnc.org to learn more today!